London, United Kingdom, Boston USA April 27, 2017 – iTrinegy, specialists in mitigating risk associated with application performance over networks, today announced general availability of their NE-ONE Version 3 Network Emulator. This latest version incorporates the new Network Scenario Builder. This capability makes it easy to test applications in varying network types and conditions over time. NE-ONE V3 is available in both hardware and virtual (NFV) appliance platforms. Adopting an intuitive “Drag & Drop” approach, the Network Scenario Builder allows users to rapidly create a chronological network experience by simply combining multiple network types and conditions running over a graphically represented timeline. The realism of these test scenarios is further enhanced by selecting from intelligent built-in transitions between each network segment to fully represent what happens in the real world. NE-ONE’s Scenario Builder comes with a library of example network experiences such as a car journey to the office, or a train journey with variable mobile network coverage. These scenarios provide a realistic representation of what can happen to the network conditions when a user’s location and/or network conditions change. An example of how the Network Scenario Builder can be used is to mimic a journey where the mobile device is first connected to the user’s home WiFi, transitions to a 3G mobile connect, then to a 4G mobile connection before ultimately connecting through to the office WiFi. Just like a video player, the Network Scenario Builder includes the ability to start & stop the timeline playback, speed it up or slow it down and set up repeat play to meet your particular testing requirements. “We have now extended this design ethos to simplify the significant challenges of building a test scenario of changing networks and network conditions over time. Until now, the industry could only deliver this capability by requiring users to create scripts. 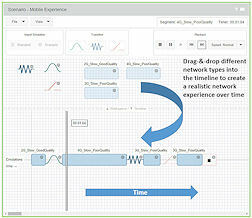 The NE-ONE Scenario Builder allows the user to easily create these varying network conditions by dragging and dropping network elements into the timeline. This enables testing of application performance over real-world networks including Mobile Networks, Cloud, Satellite, SD-WAN, the Internet and IoT”, continues Frank. In addition to the Network Scenario Builder, the new NE-ONE versions offer further enhancements and features, particularly applicable for more advanced users, including a portfolio of over 50 pre-installed network impairments. The NE-ONE Network Emulator range comprises three hardware appliances (NE-ONE Model 5, 10 & 20) and three virtual (VMware-certified) appliances (NE-ONE Model 1, 5 & 10) offering 2 or 4 ports with link speeds from 50Mbps to 1Gbps, depending on model. Customers have the added assurance that as their requirements change the NE-ONE hardware and virtual versions can be upgraded across the range simply by purchasing a new license key.